This news is not coming from The Onion. I repeat: This is really happening. 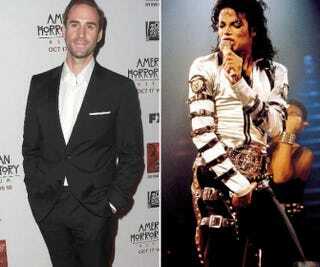 A white man has been cast to play Michael Jackson in Elizabeth, Michael and Marlon, a British TV movie about three celebrities escaping from New York City during 9/11. The urban legend concerning Jackson, Elizabeth Taylor and Marlon Brando during 9/11 goes a little something this: Jackson was in town for his huge Madison Square Garden concert, but once chaos broke out, and since air travel was shut down after the twin towers collapsed, Brando, Jackson and Taylor got a rental car and drove west, but only got as far as Ohio. The story has been disputed by Taylor’s former assistant, but I guess it’ll make for an interesting story to tell. But who cares about the story, right? Why in the world is a white man playing Michael Jackson? Did they also cast a black man as Marlon Brando? Or an Asian woman as Elizabeth Taylor? Of course not. Brian Cox will play Brando and Stockard Channing will play Taylor, according to The Guardian. A challenge, you say? Yeah, I can see how difficult it would be as a white man to play the black King of Pop. And yes, let’s not be like fourth-graders and bring up Jackson’s skin color. The British have such a funny sense of humor. Who knew they liked to troll people?